At dawn on his one-hundredth-birthday, my grandfather shuffled quietly to the bathroom, closed the door, and began to powder his face. Though “powder his face” is an understatement. What he really did was raid my grandmother’s cosmetics cabinet and use up an entire bottle of foundation. He was working his way through a new blush compact when my grandmother intervened. Grandma was surprised, but not too surprised; she knew what she was getting herself into when she decided to marry a man from Shanghai. After all, Shanghai is the most superficial of Chinese cities (just ask those from Beijing, the most intellectual city) and appearances are of the utmost importance to its people, émigrés or not. Born at the end of the Qing Dynasty, my grandfather had grown up in a changing, cosmopolitan city, occupied in turns first by the Japanese and then the British. Communism was the last thing on his mind when he took a job as a Customs Official, a respectable and stable position for which one could don an officer’s uniform everyday and wear a gentleman’s suit at night. The job promised rotations around the Chinese coast as well as Hong Kong and Taiwan. This appealed to my grandfather, who liked to travel and learn conversational amounts of foreign languages. He was fascinated by notions of European glamour, and as Shanghai and indeed China at large began to divide over the traditions of dynastic China and modernization as inspired by the West, my grandfather adapted easily to the latter, or outwardly at least. However westernized his aesthetic tastes, at his core, he was a Shanghai man – exceedingly thrifty and bargain-savvy. Long before Warren Buffet stated “Price is what you pay, value is what you get,” the Shanghai man of my grandfather’s day knew well the art of looking one’s best for spending the least, and at this, my grandfather was the master. His suits, shirts, and coats, all bespoke, were made in China by one of a hundred million tailors. His shoes, simple black loafers with a tiny gold pin on the side, were very Western indeed, but they too were made and bought in China for a quarter of what the Western man was paying. Ties and silk handkerchiefs were bought in bulk on my grandparent’s biannual trips to back to Shanghai, ten for the price of one. By his one-hundredth birthday, dozens of ties were still unopened. For some however, vanity blossoms with age as it did for my grandfather. The aforementioned items and activities did not make their appearance until after my grandfather had immigrated to Taipei and the meticulous dressing and grooming habits he had developed in twenties stayed with him throughout his life, regardless of where he lived. No matter how hot and cloying the humid Taipei air, grandpa never left the house without a full suit and tie, which was always held in place beneath the fourth button (then the third, as he began to shrink with age) by a glittering tie clip. The shine of his perpetually buffed leather loafers matched that of his well-oiled hair, which he combed down each morning with a tortoiseshell comb smeared with imported lanolin. For a centenarian, he had a remarkably youthful complexion: nary a sunspot, mole or blemish could be found on his soft cheeks or anywhere on his body, for he was a businessman whose affairs led him from house to car (chauffeured by Grandma) to office and vice versa. For forty years after his “retirement,” he continued to go to the office, not because the company needed him (though my uncles stoked their father’s ego by bringing him all the checks to sign) but to keep up appearances. He laughed at the other retired old men who sat in the park wearing unsightly white undershirts, frayed shorts and plastic sandals from the Seven-Eleven, cooling themselves with straw fans. They only dressed up when their grandkids came to take them out to lunch. My grandfather dressed to the nines everyday and took us out to lunch. It was in Taipei that he found a new life for himself, though not by choice. His career as promised, had rotated him to Taipei for a short period – but civil war broke out between the Communists and the Nationalist Kuomintang Party and the latter retreated to Taiwan after the war, closing the gates to the Mainland behind them. My grandfather was lucky – he did not escape in the tumultuous, life-threatening hoards, as my mother’s parents did, but was rather assigned to leave the country in the middle of the 1940’s, with the expectation to return. But as politics and wars go, one thing led to another and, as his country tore itself apart, my grandfather sat serenely from his post across the strait and wondered what all the fuss was about. Here, in my biographical ignorance I am being cruelly speculative; my grandfather did have his share of troubles. He was married at the time to his second wife and along with her, had three daughters back in Shanghai. The strait closed in 1949 and my grandfather would not see his family for another thirty-eight years until Martial Law under Chiang Kai-Shek had ended and the Chinese in Taiwan were allowed again to visit the Chinese in China. This was in 1987, but by then, my grandfather already had another family. Before you call him a philanderer or other vicious names, let me first divulge the secrets of longevity: surround yourself with those who make you happy, have children (sons, preferably), and live. This is what my grandfather did. In the face of political upheaval and the disintegration of his nuclear family, it was the only thing he could do. 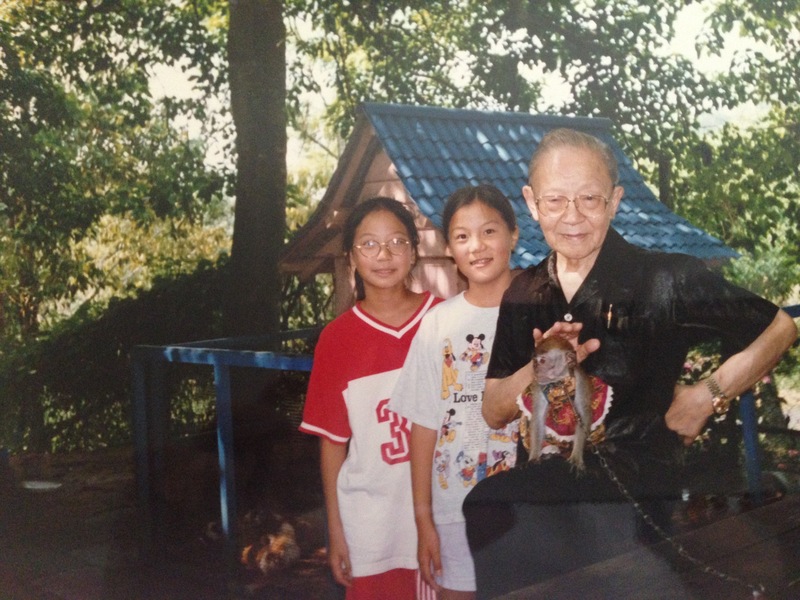 He redirected his center, accepted Taipei as his new home, and created a family.